Ultimately, each kind of editing can mean different things to different editors. But even when you have the lines between the various types of editing more clearly defined, certain styles of editing can bleed over between types and others cannot. It all depends on timing and the needs of the manuscript or publishing house. Lately, I’ve been seeing an influx of advertisements for online grammar checkers on almost all of my social media accounts. For a while now, I’ve tried to ignore them, chalking up the barrage of ads to the internet gods knowing how to market to a book lover, but I’ve begun to wonder what these online checkers mean for today’s writers and editors. The compilation edit is unique to the operations of our teaching press, but coordinating this type of edit has been an invaluable learning experience for me as an editing professional. 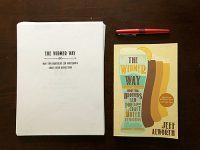 Editorial work is often more of a flexible art than a task that follows a standard procedure, as there are many ways to work with an author to bring out the best in their work. Another season has passed for the 50 Hikes in the Tillamook and Clatsop State Forests team, and the project feels ever more real to us. Since our last update, our talented design team has brought together the many elements of this book—the photographs, maps, illustrations, informational icons, and text—into a cohesive product. Dedicated readers of the Ooligan Press blog already know that The Ocean in My Ears has an absolutely gorgeous cover (for those who are unfamiliar, click here). But did you know that—thanks to the keen and diligent eye of Maeko Bradshaw—we are soon to have an equally impressive interior? While the interior design of a book often doesn’t get the fanfare of the cover, a well designed interior creates a “cohesive product that enhances the entire experience,” as our own Justin Orendorff wisely points out in his post.